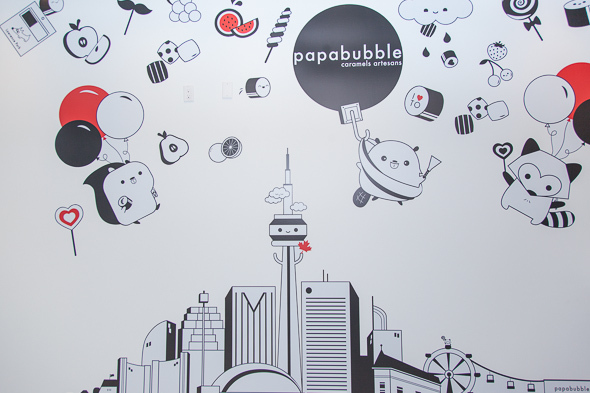 Papabubble is an artisan candy shop sandwiched between a Mastermind Toy Store and a Shopper's Drug Mart on Yonge St. north of Lawrence. This prime family-friendly foot traffic loction is no accident, as the shop has been in the works for many months, with partners (and childhood besties) Jennifer Liu and Catherine Chan at the helm. Purposely opting for an uptown address, they've joined the ranks with a tidy pocket of gourmet goodies suppliers, with neighbours like The Rolling Pin , Bobbette et Belle and Butter Avenue all in the vicinity. 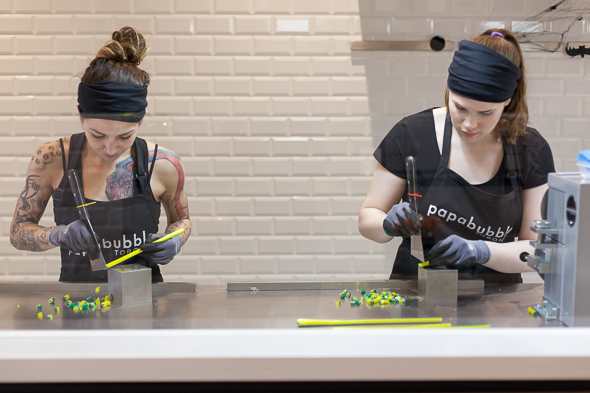 Papabubble may be a new name to Toronto, but worldwide it's as synonymous with candy as Willy Wonka. In addition to NYC and LA, Toronto marks the third North American location, and the first in Canada, with another 40 or so locations peppered through Europe and Asia. Candy makers Charlene Giasson and Calandra Bond took a three month crash course in the art of crafting candy, learning from Alejandro, a Spanish import candy connoisseur, who flew in to show them the ins and outs of building intricate patterns and lettering that the company has built its brand on. 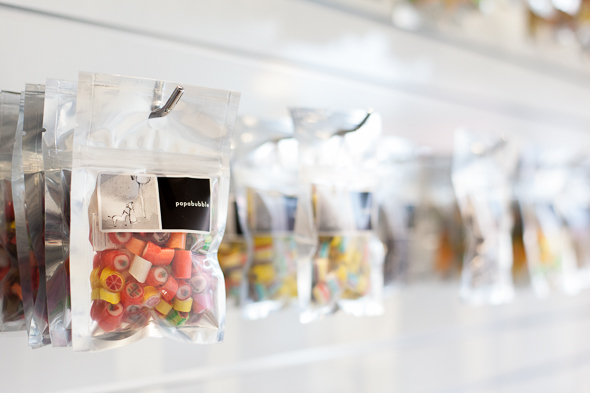 All the candy is made in house by boiling sugar at a scald-worthy 160 degrees Celsius. Pouring out the sugar lava on the cooling table stabilizes the sugar, then it's time to add the colouring and start shaping the candy into different shapes to create custom looks. The hook is brought in to add air to the sugar and make it fluffy, extending the sugar and making it more malleable. 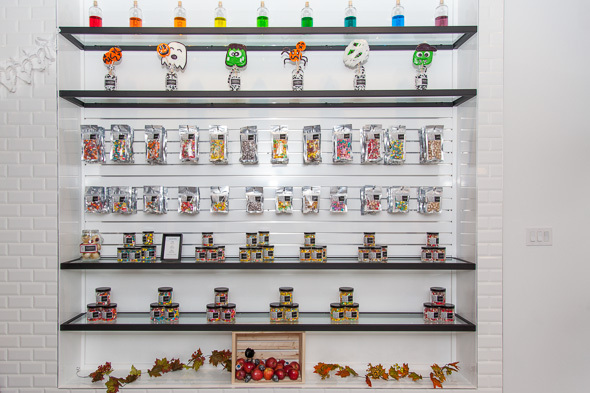 The colours added are from their juicy lineup of all natural flavours, like lemon, cherry and other usual suspects, but also more adult offerings like pomegranate, cranberry or mango are thrown in for good measure. Prices start at $4 for a fancy lollipop, which may seem steep, but considering the candies are made by hand with over the top decorations, it goes without saying that labour plays a pretty big factor in their cost. 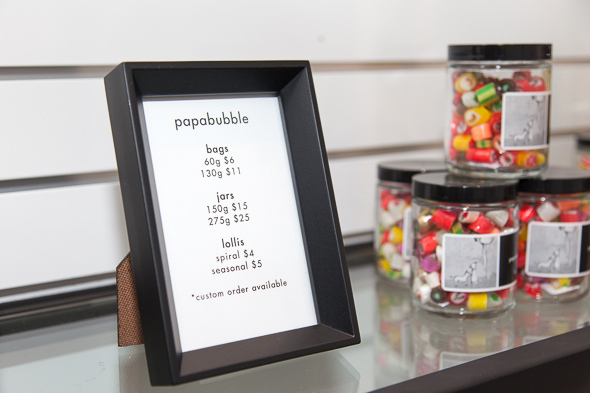 Design is not reserved for just their sweet treats either; the tidy shop has a minimalist feel to it, flanked by a massive bubbly mural created by local Toronto artist Rosey Cheekes. 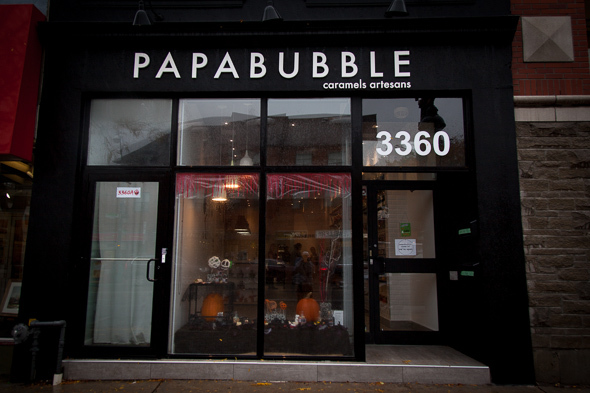 Those who don't get uptown so often can look for Papabubble sweets available at Squish and Petite and Sweet .